On 21st June 1877, in the anthracite-mining county of Schuylkill, Pennsylvania, ten Irish immigrant men alleged to have been members of an oath-bound secret sect of vigilantes called the Molly Maguires were hanged in what came to be known as “The Day of the Rope”. Twenty members of the group in all would be executed, following a kangaroo court that American historian John Elliot called “one of the most disgraceful episodes in the history of the bench and bar in the United States.” Oppression, exploitation, racial and ethnic bigotry, strikes and union-busting are common enough themes in the American labour movement. But the story of the Molly Maguires and the ruling class’s attempts to destroy these Irish workers is so especially contemptible it has achieved legendary status. Did the so-called Molly Maguires – said to be part of the Ancient Order of Hibernians – even exist? Molly Maguire might have been a real woman or she may have been a myth. Whatever the truth, she served as an Irish talisman against agrarian oppression in 1840s Ireland. In the wake of famine and land seizures, her symbolic spirit was relocated to the United States – along with two million Irish emigrants. But for these new hopefuls in the land of opportunity, “Irish Need Not Apply” regularly appeared alongside “Help Wanted” ads. For many, the only option was the brutal coalmines of Pennsylvania. The conditions were perilous, the pay pitiful. Workers lived in homes owned by the mining companies, forced to buy all their supplies from company-owned shops at inflated prices, leaving them in debt and enslaved to their employers. In spite of hazardous conditions that regularly led to death tolls in the hundreds, the mining industry fiercely resisted unionisation. In 1874–1875, after Pennsylvanian coal-miners went on strike, the Molly Maguires allegedly began sabotaging mining equipment and facilities – detonating bombs along rail lines, roads and bridges so that mine owners couldn’t bring in replacement workers. The ruling class called it terrorism, others called it resistance. Industrial leader Franklin B. Gowen called in the notorious Pinkerton Detective Agency, who hired an Irish American to infiltrate the miners. Over the course of two years, James McParlan – under the alias James McKenna – befriended the Irish community, all the while gathering the evidence that would eventually hang twenty men. 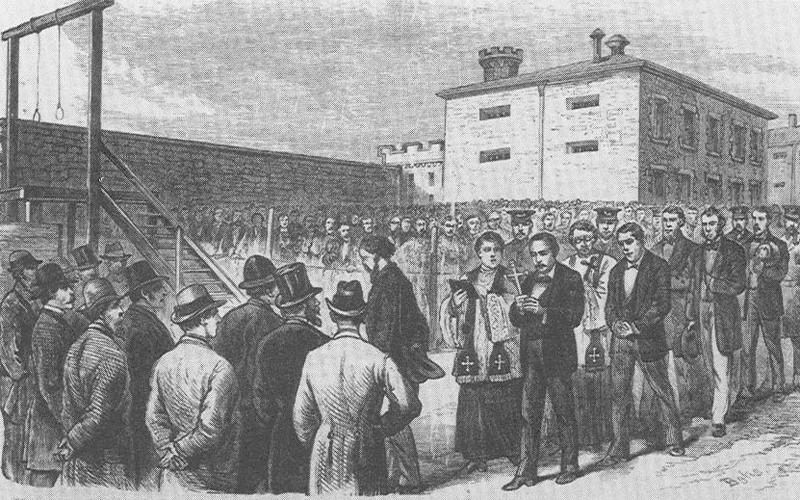 Following the executions, nothing more was heard of the Molly Maguires. No admission of vigilantism was ever offered from the Irish American coal-mining community and, if the Molly Maguires ever existed, they left no evidence of themselves. The only accounts were written by those with hostile interests. This entry was posted in Atrocities, Dissent. Bookmark the permalink. Was not the last disgraceful episode. “Duffey’s Cut” at mile marker 59 on the rail leading out of Philadelphia, near Conshohocken, is the grave of a number of Irish immigrants that worked the rail in that area. An outbreak of Cholera lead people in the area to blame the Irish workers. Men, women, and children were killed execution style. A brilliant piece of historical writing – thank you! Conan-Doyle in his Valley of Fear told also this story from the point of view of the mine owning magnates making the union men, as Dorian pointed, look like terrorists. Great blog. I am related to one of the Molly Maguire’s Edward Kelly. He was my Grandmother’s great uncle. She lived in Ashland, Pa. and her name was Gertrude Kelly until she married a McGinley. I am also a relative to Edward Kelly on my mother’s side of the family. He was about a 1st cousin 4x removed (I think). I have Edward as the grandson of Mike Kelly (the immigrant Kelly) of Parish Kilconnell, Co. Galway, Ireland about 1840. Contact me if you’d like to compare information on the Kellys. Is there any connections between a John Kelly born around 1866 in carbon county. I am a relative of Dennis Bucky Donnelly, he was my great grandmothers brother, my name is Bridget, I was named after my great grandma…..Her name was Bridget Donnelly Tierney. LONG LIVE IRELAND……..EMERALD!!! I am also relataed to Dennis Donnelly. His wife, Mary Mame Kelly Donnelly was my great great aunt. I am trying to learn all I can about the Molly Maguires, as they are represented as both villains and heroes. I am the great granddaughter of Dennis “Bucky” Donnelly and am named for his daughter, Alicia Donnelly. Great piece. It’s hard to even imagine the hardships they had to endure back then with all the luxury’s we have today and having a choice to what career path we want in life today. I am proud to say that my great grandfather jack kehoe did not die in vain and so much has come from his death along with the other men that were hung with him. My uncle Joseph Wayne fought hard to get that pardon from Governor Shapp and from what I was told it was the last thing the Governor did before leaving office because of fear of any repercussions for doing so. Even in 1979. Which is hard to imagine but I guess people that were powerful back then still maybe even today. I always felt John Kehoe and the guys were railroaded by the coal agency. The railroads, the coal owners, the doctors and lawyers of the coal regions always kept the coal areas suppressed. After the hangings, their stranglehold kept out unions, progress, and maintained such a hold on the Anthracite area that it remained a depressed area even to this day. Towns like Tamaqua never became areas where the young wanted to live and stay. It is not quite accurate to say the Mollies disappeared after the trrials and hangings. I’ve known people who lived in the coal fields who verified the “spirit” of the Mollies lasted many years after the executions. I believe, after much reading and speaking with these older folks, that Gowan, MacParlan & Co. concocted the Molly Maguires to validate their persecution of the miners who were pushing for better conditions. What they didn’t expect was their myth taking on a life of its own and lasting well into the early 1900s. was a great film i saw years back , the molly mcguires , with sean connery. anyone rem. I am a grand nephew of Alec Campbell, author of A Molly Maguire Story Revised Edition, available on Amazon Books. The Sean Connery movie on the Mollies is not based on the reality of the Mollie era. It is a sanatised Hollywood version of the era. I have read A Molly Maguire Story. I don’t think it is the revised edition but it was written by you. I found it in my district library. I have used some of the facts you gave in my history day project. Thank you for all the great information.